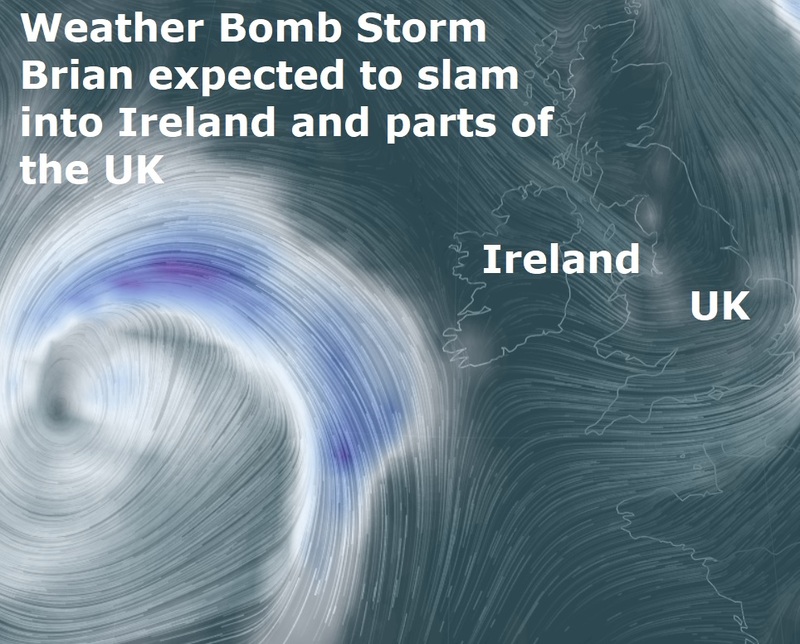 "Weather Bomb" Brian is the second named storm of autumn in the northwest Atlantic and after it's battering from ex-hurricane Ophelia the west coast of Ireland is expecting another head-on collision. Brian is expected to slam into Ireland on Saturday morning. High spring tides are expected to aid flooding along the coast. Storm Ophelia slammed into Ireland last Monday, leaving hundreds of thousands of households without power and leading to the closure of the entire public transport system and numerous businesses. At least three people were killed by falling trees when the storm made landfall with gusts of up to 160km/h battering the country's west coast. The military was on standby to assist emergency service after the government declared a national emergency. More than 300,000 customers were without power in "the worst storms the Irish have dealt with ever". An intense low-pressure system that is forecast to affect southern Britain on Saturday has been named as Storm Brian by Met Éireann. The Met Office’s Irish partner took the decision earlier today to issue an Orange warning for some parts of Ireland on Saturday because of expected impacts across the Irish Republic. Under the collaboration between the Met Office and Met Éireann, a storm will be named when it has the potential to cause an amber/orange or red warning. Today the Met Office updated their Yellow wind warning for strong southwesterly winds on Saturday from 4 am covering parts of southern and western England and South and West Wales. Currently the Met Office has no plans to issue an Amber wind warning for any part of the UK, but the situation will be under continual review. Chief Forecaster Dan Suri said: “Storm Brian is expected to bring strong winds to southern and western areas early on Saturday morning. The first and most significant land-based impacts will be in the southwest of Ireland, hence the Amber warning from Met Éireann. At the moment, we don’t expect the same level of impacts for the UK. “As we go through Saturday morning and early afternoon the strong southwesterly winds affecting the South West will transfer east and slowly change direction as they will become westerly towards the end of the warning period.